The World Ends with You came out over 10 years ago. Dear lord, I can't believe it's been that long. I remember the day I got The World Ends with You. The DS was firing on all cylinders by this point, and tons of great titles were available. Even with all that competition, The World Ends with You was something special. It was a brand-new IP from Square-Enix, who was really showing their support for the DS. This was a major effort from a company that was once known for sticking VERY close to tried-and-true brands. Square-Enix greenlighting The World Ends with You was a big deal. Now here we are with 2018 winding down, and we're still talking about the game. Rather than putting out a true sequel, we've had 10+ years of revamps and re-releases. The latest in that trend is The World Ends with You: Final Remix for Switch. With a name like The World Ends with You: Final Remix, you'd also imagine that the game would have been tweaked, reworked, and adjusted to perfection. While the core gameplay of The World Ends with You remains just as fun and engaging in Final Remix, it's some of the other pieces/parts where Square-Enix seems to have stumbled. For those who are unfamiliar with The World Ends with You, here's a quick rundown. You're thrown into the role of Neku, a boy who's plopped down into some strange game of life of death without any explanation. Over the course of 7 days, you have to not only fight to survive against other players and monsters, but also figure just what this game is all about, and how to escape it. 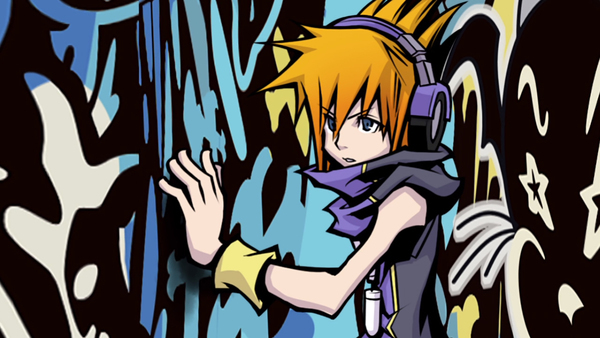 Neku starts his journey with a handful of pins, which are used to line up various attacks. As you progress through the game, you'll meet more allies/enemies, gain more pins and other goodies, and hopefully figure out exactly what's going on. As I mentioned at the outset, the core gameplay mechanics of The World Ends with You: Final Remix are still deeply enjoyable all these years later. As you battle various monsters and make your way through the game, you'll collect all sorts of pins that you can level up. These pins let you attack your enemies in various ways. You'll get pins that let you shoot fire, throw energy balls, cast lightning, toss around objects in the environment, and many more. You'll also team up with an in-game partner for special attacks that dish out big damage. There's even a fashion element to the game, where wearing specific clothing in certain areas can boost the effectiveness of your attacks. 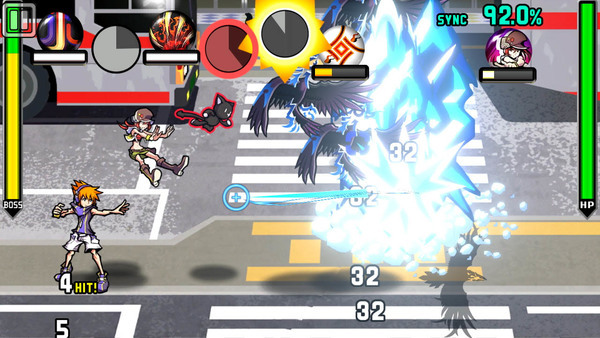 While The World Ends with You: Final Remix is an RPG, the battle system isn't turn-based. This is a super frenetic battle system that has you really working hard in each and every battle. Depending on the pin layout you've chosen, you'll be swiping, poking, or drawing all over the screen in order to cast your magic. 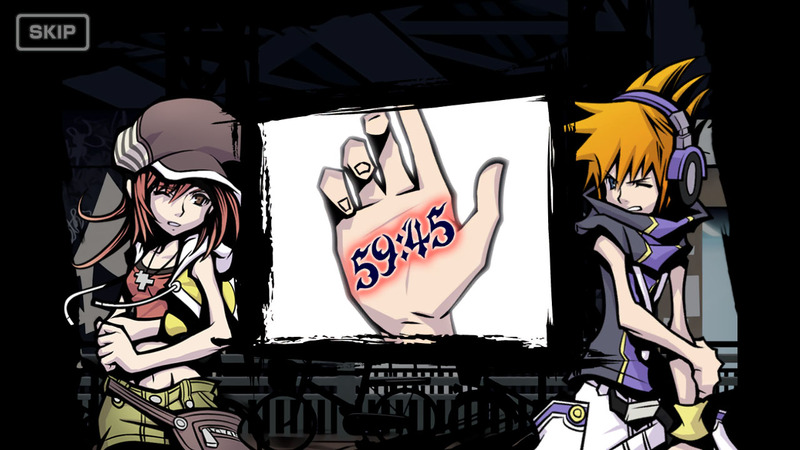 On top of that, you'll have to drag and swipe on the screen to move Neku out of harm's way. There will rarely be a time when you can sit back and take it easy during battles. Yes, there are cool-downs for some of your pins which forces you to hold off for a second or two, but you'll still be swiping all over to make sure Neku keeps a safe distance from the opposition. Back on the DS version of The World Ends with You, you were working with quite a small touch screen. This made it fairly easy to make moves/actions by mistake. Sometimes you'd want to swipe Neku away from danger, but you'd use a pin instead. Other times you'd try to swipe to make a cut, but instead throw Neku right into the path of an enemy. Add in some pins requiring certain distances between you and enemies to cast them, and you can see how things could get fouled up pretty easily. Unfortunately, the exact same issues are present in The World Ends with You: Final Remix, and they might actually be worse. You'd think the bigger screen of the Switch would make it easier for Square-Enix to at least cut down on accidental/missed inputs. Sadly, that does not seem to be the case here. I made countless errors based on touchscreen inputs that weren't intended. I walked myself right in front of attacks, used the wrong pins, and sometimes even got hung up on items in the environment when trying to swipe around them. Even after putting in a bunch of time with the game, I only learned to work around these quirks to cut back on them, but I couldn't eliminate issues completely. You'll get a hang of things and the controls are serviceable, but mistakes will be all but avoidable. You'd think from the original, to the iOS ports, and now to this Switch version, Square-Enix could have fixed up these issues, but it seems they still struggled. That's how things play out if you're using the touchscreen on the Switch itself, but what about the other mode available? While you can't use a Pro Controller, The World Ends with You: Final Remix does let you play with a Joy-Con. You'd think this would fix things up and be the preferred way to play, but it is definitely the opposite. While the touchscreen frustrated from time to time with mistakes, I found the Joy-Con control to be an absolute mess. No matter how you play The World Ends with You: Final Remix, you're never able to use an analog stick to control Neku. On the touchscreen you'll touch and drag to move him around. With the Joy-Con, you have to point at the screen with a faux pointer and then point where you want Neku to go while holding a button. The touchscreen movement control I get completely. I know some will complain about that, but I was fine with it. The Joy-Con movement makes absolutely no sense to me. You have the analog stick RIGHT there, and you can't use it to move! Basically, Joy-Con mode treats the Switch screen or your TV like a giant virtual touch screen. You'll have to point/click on enemies to attack. You'll have to point/hold a button to walk. You'll have to swipe/swing to do some attacks. Again, this is MUCH easier with the touchscreen because you're making physical contact on the character/enemy/path with your finger. With this Joy-Con mode, you're just swinging around a pseudo Wiimote pointer to get the job done. It simply does not feel good, and for me, it complicated the entire experience. Given the choice, I would play a game on Switch in docked mode, rather than handheld. With The World Ends with You: Final Remix, I felt like the only real option I had was handheld play. 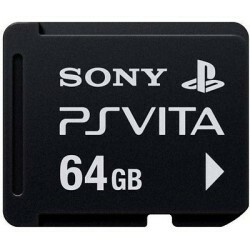 If I wanted to have the most amount of control over the game, this was my only choice. Direct contact with the touchscreen just makes a lot more sense, even with the hiccups along the way. I just want to make it very clear that The World Ends with You: Final Remix's Joy-Con mode is using a faux pointer system. To elaborate, this means you're pointing the Joy-Con at the TV, but this is not like the IR setup the Wiimote had. This is a system that has you point to where you feel the center of the TV is, and then lock it in. The Joy-Con is getting no data input from the position of your TV. This means that as you play on, you'll eventually drift out of position and the pointer will need to be re-centered. This was rarely the case with the Wii, as you had the IR sensor sitting right there on your TV. With all the pointing, swiping, dragging, and moving The World Ends with You: Final Remix has you doing, be prepared to re-center your Joy-Con quite frequently. 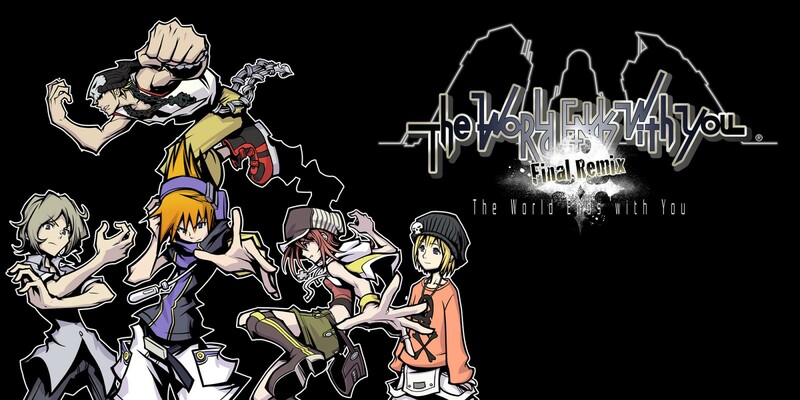 As for the rest of The World Ends with You: Final Remix, it's certainly interesting. For me, some of it hasn't stood the test of time, and some of it has. Again, seeing the treatment Square-Enix gave this game on the original DS was staggering. Gorgeous visuals, a soundtrack filled with songs with vocals, and a unique gameplay experience. All those elements are still here, but some of that content has lost a bit of its original luster in my eyes. Even back when I originally played The World Ends with You on DS, I found the soundtrack to be a bit cheesy. It was definitely impressive in its variety and scope, and it has a handful of tunes that I really enjoyed. That said, there were tracks that just grated on me due to their off-key vocals or awkward localized lyrics. 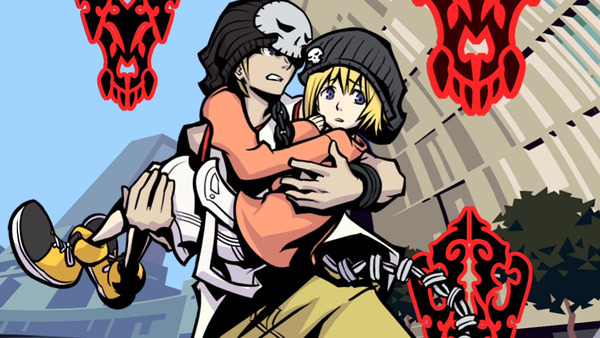 All of that audio experience is in The World Ends with You: Final Remix, for better or worse. Obviously you're getting the music in much higher quality, which is a plus no matter how you look at it. There's also remixes of the original tunes, which again, is very welcome. That said, these are definitely the tracks I remember from 10+ years ago. While the quality of the audio and breadth of tunes is impressive, a large portion of the tracks just don't tickle my fancy. The game's story and characters were a mixed bag back in the day, due to some lackluster localization. There were moments I truly enjoyed and actually made me feel something, and others that made me think back to the very early days of anime localization where things just didn't make sense. I'm not quite sure if the dialog/script for The World Ends with You: Final Remix has been spruced up since the DS original, but I definitely still get those same vibes. Some moments take me out of the experience, and others draw me in. I do think the overall story is a truly interesting one, and it kept me engaged throughout. It's just that some of the characters along the way are poorly written, which hurts the experience. Plus, for me, I really don't like Neku. I mean, I don't think you're supposed to like him for much of the game, but I never really got to a point where I flipped. I end up barely tolerating him! I mean, I guess that's a sign of at least somewhat decent writing, because there's no doubt that early on, Neku is supposed to be an extremely unlikable person. The one element I still do enjoy is the game's artwork, which I loved back with the original release as well. It's definitely an acquired taste, but it's got a unique sense of style and is definitely bold. Everything for The World Ends with You: Final Remix has been revamped in a major way, and it looks absolutely gorgeous on your TV. Again, I wish I would have liked the Joy-Con controls more to enjoy the experience on TV, but even in handheld mode, the visuals really do shine. If you dig the art style, you're not going to get a better look at The World Ends with You than in Final Remix. Does The World Ends with You hold up 10+ years later? I'd say in the most important ways, it does. The game is still a blast to play, and the battle system remains super addictive and action-packed. The game's sense of style and attitude shine through, and provide a feeling we haven't seen much of since the game originally released. The soundtrack, love it or hate it, is very much a time capsule of when the game launched. The World Ends with You, in any version, ends up being an experience worth taking. It's just sad that The World Ends with You: Final Remix didn't end up being the definitive version. The 'Final Remix' subtitle makes you think Square-Enix isn't going to revisit this game again for revamps and tweaks. That alone should have been enough to triple check that everything was ironed out for this release. While the major moving parts still click, elements like controls could have done well with a lot more attention. If this is the only way you can experience The World Ends with You, it's still worth checking out. If you have access to the iOS version, or even if you still have a DS sitting around, those options might be the better way to go. They might not look or sound as good, but they may very well let you play better. The only TRUE leg up The World Ends with You: Final Remix has on the other versions is the brand-new post-game content. Without giving spoilers on that content, let's just say it's not quite worth the price of admission alone. It's something die-hard fans will probably want to experience to get another taste of the universe through new story, but it's not exactly engaging. There are some moments here and there, but it all feels a bit rushed and tacked on. My fears came true. Glad I passed on this again. I&apos;ll happily pull out my DS version to revisit this title.